Ride endless singletrack in the White Mountains. Trip for 2! Get 6 months to pay $649.00 with PayPal Credit! No payments + no interest if paid in full in 6 months. 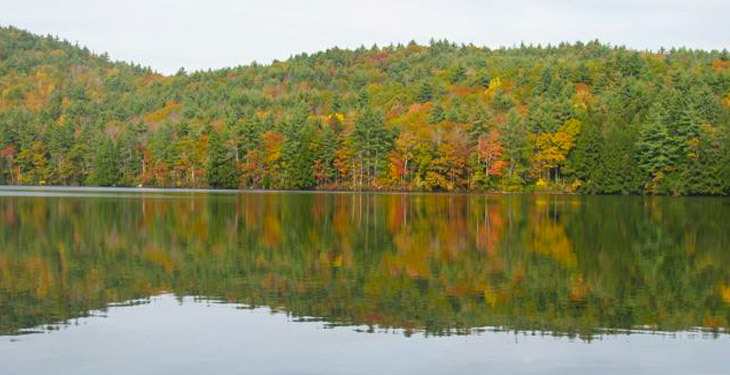 The mountains of New England are breathtaking, offering an abundance of outdoor adventure and discovery. 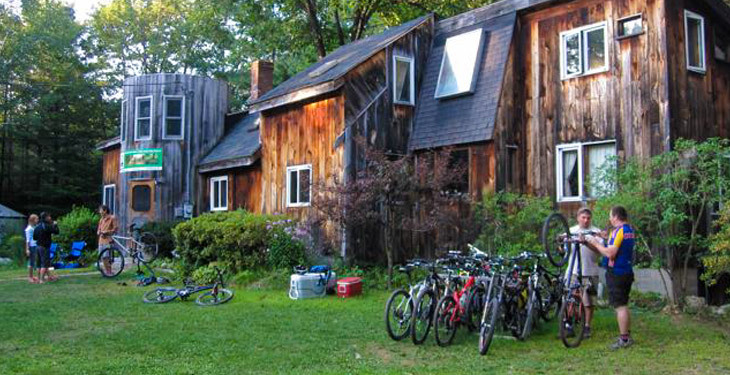 This 4-day mountain biking getaway offers a peaceful and exciting pedaling adventure! 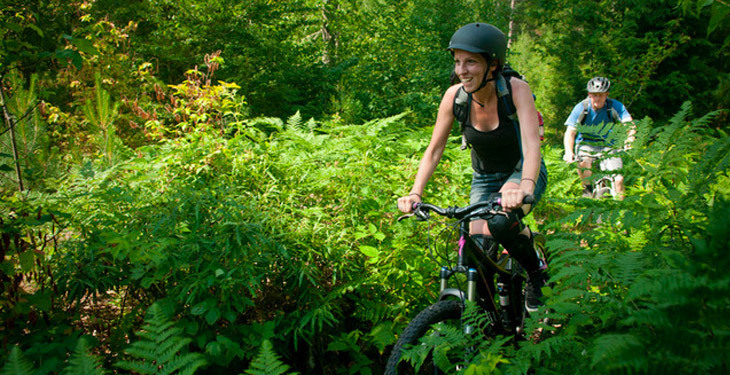 Tucked away in Western Maine’s White Mountains lies 30 miles of singletrack, a private reserve maintained by Back Country Excursions. The trails wind through forests and past glistening mountain lakes, making for the ride of a lifetime. After spending the day adventuring, unwind at the cozy mountain lodge compound. Enjoy delicious breakfasts and lunches on the spacious flagstone porch. Rustle up your own dinner on available barbecues or in the lodge kitchen, or go out to a variety of local eateries, then soak away the day’s soreness in the wood-fired hot tub before heading to bed. Rides are geared and grouped according to rider ability, stamina, and comfort level, so you can either get your adrenaline fix or be carefully instructed by an expert guide on trails appropriately matched for your ability. The trail system offers a wide variety of terrain and elevations, suitable for every interest and skill level. There's even a 4,000 square foot Technical Terrain Park right in back of the lodge, complete with drop-offs, log chutes, stairs, and more! High quality bikes and helmets are included in the package, allowing you to travel light and skip the baggage fees. If you want to take a break from mountain biking, you always have the option to hop in a kayak or canoe or go inner-tubing at the nearby lake. Back Country Excursions is now a host of Concerts In Your Home, a national and international singer-songwriter concert series. Most weekends Back Country Excursions sponsors singer-songwriters that will be performing at the lodge. Highly talented musicians and artists from all around the USA and abroad will be performing either Friday or Saturday evenings in their yurt or lodge. Note: Please see the FAQ section if you are interested in purchasing this trip as a solo traveler. Arrive today and receive your room assignment. You'll have time to settle in and get to know the other riders. Days 2 – 3 Two full days of mountain bike action! Rise early for breakfast, get fitted to your bike, receive instruction if you'd like, and head out on a group ride. Lunch is served at the lodge. Afterwards, spend your time lounging, swimming, kayaking, or mountain biking some more. Evenings are spent getting dinner at the local spots, lounging by the fire, or relaxing your muscles in the hot tub. Spend the morning riding, and then depart in the afternoon. What an awesome weekend! Thanks for your great instruction, delicious meals, and delightful conversation. 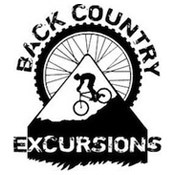 Founded in 1991 by Cliff Krolick, Back Country Excursions is the first and longest-running mountain bike touring company in the Eastern United States. Cliff started by first promoting eco-biking tours and multi-sport adventures, but mountain biking quickly became the main draw. Cliff’s love of nature and his deep personal conviction that “the quality of human life is directly related to our appreciation and gratitude for the natural community” make it clear that getting in touch with nature on a mountain bike is the top priority. Cliff’s aim is to share rare and beautiful natural and wild areas while making minimal environmental impact. Portions of the proceeds are donated annually to local environmental causes. This was exactly what I was looking for as a weekend getaway. The lodge is a bit rustic but eco-friendly and more than sufficient...The meals provided were healthy and hearty...but most importantly, the biking was amazing. 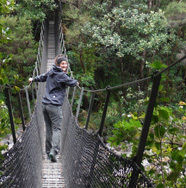 Cliff and company have handmade miles of trails that cover a wide range of difficulty. I had very minimal mountain biking experience, but I was provided with equally supportive and challenging guides. All of the rental bikes are in excellent condition; I rode a bike that was only 2 months old. And the wood-fire heated hot tub is a nice touch at the end of the day! I've just returned from three days mountain biking with Cliff of Back Country Excursions in Parsonsfield, Maine. Cliff has designed and built over 26 miles of trails outside his front door. There are trails for all levels and Cliff tailors the tour based on fitness, experience and ability of the rider. There are sweeping trails for the speed freaks, see-saws for the trick inclined and enough uphills to get the heart rate going. Cliff has the biggest collection of cycling magazines I’ve ever seen, which are great for chilling out after a few hours riding. In summary I’d thoroughly recommend heading to Cliff with a group of mountain bikers for a few days riding. This experience is not a leisurely ride in the country. Cliff is passionate about mountain biking and his organic, energy-efficient, sustainable lifestyle. Cliff wants novices, like me, to appreciate the sport and enjoy the total experience of the weekend. He is attuned to your ability, but expects you to want to get better at mountain biking so you can enjoy it. I did the two-day package, which was enough for my physical condition and experience. Cliff was constantly coaching me to help me get better, but he was also considerate enough to ask if I was close to finished for the ride. For two of the three rides I left for the hot tub while the other riders headed for another half hour of challenges. I enjoyed Cliff, my fellow riders, who had very different backgrounds from me, and the whole experience. Simply reach out to Back Country Excursions directly and be sure to provide your order number. Contact email: bcountry@psouth.net or call 207-625-8189. Your voucher is valid for a 4-day/3-night stay until November 1, 2019. Reservations are subject to availability. Do not make travel arrangements until you have received confirmation from Back Country Excursions. Are there any blackout dates I should know about? Contact Back Country Excursions for specific directions when you finalize your reservation. Google directions are not reliable, but you may use a Garmin-style GPS for driving directions. The nearest international airport is Portland International Jetport. What are the trails like? 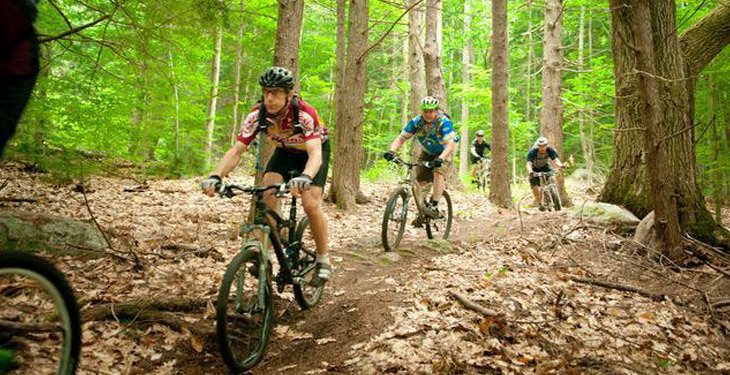 Back Country Excursions gives you access to over 30 miles of pristine mountain biking trails. They range from easy rolling terrain to steep climbs, long downhills, water crossings, switchbacks, and more. The trails are virtually mud-free during the riding season. You'll ride amongst pine forest, along rocky lake shore and over river bridges. Your guide will help select the best trails for each day's ride. High quality, fully equipped mountain bikes and helmets are included in the trip package, so you don't need to worry about the extra expense and risk of traveling with your own bike. Will my departure feature the Concerts in Your Home Series? Back Country Excursions is now a national and international sponsor / host for Concerts In Your Home. 2-4 times per month they will be showcasing very talented musical artists /singer-songwriters from around the USA and Europe. Concerts will be planned for either Friday or Saturday nights. There is no additional fee / no cover charge to the guests, however donations are always welcome and all donations go directly to supporting each artist's performance. Upon booking your reservation, if interested, please inquire about Back Country Excursions' concert schedule to see who may be performing. This three-night trip offers three options, based on availability. 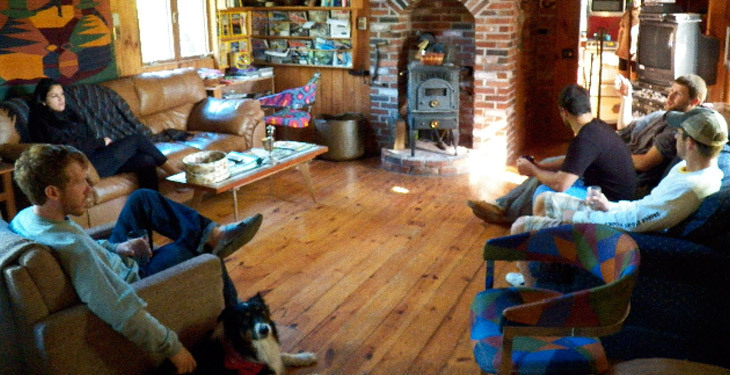 There are a limited number of rooms available in the lodge. 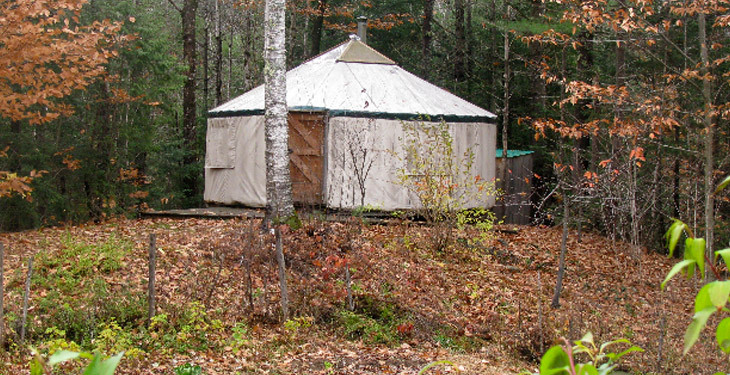 There is also a yurt that's popular for group use (sleeping bags recommended), or you can camp (full facilities). I'm a solo traveler. Is there a way to purchase this trip for one person? Single rooms can often be accommodated, especially with advance notice. Please contact Customer Support if you are interested in the single traveler rate of $325. All meals are prepared homemade, and never out of a box or a can. Favorites are chili, fresh cornbread, salads, black bean and veggie burritos, muffins, granola, waffles, pancakes, and of course, maple syrup from Maine. Roughly $75 should be sufficient to cover dinner expenses and gratuities. It is recommended to leave 15%-20% in gratuities for the guiding, instruction, and staff assistance. Back Country Excursions will provide a packing list in their welcome email along with other trip information. What if I haven't ridden a bike in a couple of years? No prior mountain biking experience is necessary, but you should be in fairly good physical condition, and be comfortable on a bike. Book confidently with Free Cancellations within 72 hours of booking. After 72 hours, cancellation fees will apply. Cancellations are subject to the full discretion of Back Country Excursions. For more information on our Travel Cancellation Policy please Click Here.